Which options remain now after WAAS/EGNOS did so poorly here in central Europe? This system has been extended land-inwards, which provides a pretty good coverage here in Berlin. There are 2 DGPS stations which transmit the signal. One in Mauken (approx. 100 km away from Berlin) and one in Groß Mohrdorf (approx. 200 km from Berlin). The accuracy is < 5 meters when using ECDIS. This system is bound to LORAN-C, which will not be available in the near future. Usable, but you should expect shadowing effects due to the low above horizon orbit of the geostationary satellites (like we did not know that 😉 ). More information is avaiable through the ESA website at http://www.egnos-pro.esa.int/index.html93. Should be available. But it is not free. More information can be obtained here http://94www.sapos.de95. Also not a free service of the town of Berlin, but if the fees are not that high, it is worth trying this one out. Seems we are stuck with the services provided by the German land survey and the federal waterways administration. Let’s try both! But wait, there is still the problem: How do we get the data in our GPS receivers? The RTCM standard provides a solution for that. It feeds the correction signal either from internal or external receivers into our DGPS enabled GPS receiver (through a serial interface for instance) – and we are good to go. For the medium wave solution (MW-DGPS) there seem to be a couple of receivers out there targeting semi-professional (that’s probably what I want) to professional users from Trimble, Sitex, Garmin, Magellan, Leica and Thales (prices ranging from 300 Euros to way beyond what I would like to spend). For sure those receivers can also deal with DGPS data delivered through other sources (like the internet) – but I would like to find a low cost (approx. 100 Euro) solution that is compact in size and does not require additional antennas for reception. A mobile data connection would be most convenient for me. So the next installment will probably be about DGPS devices and how to feed them the data. On the weekend I had some time to go hunting for WAAS / EGNOS satellites. Equipped with a GPS receiver (the Holux GPSlim240) I went to the highest (well – in Berlin it won’t get any better than the Teufelsberg with 115 meters) mountain around and looked if I could receive any of the EGNOS satellites. Unfortunately none of them (not AOR-E, nor IOR-W) showed up despite the good position (all visible obstables had a ground elevation below 10 degrees). Well, this makes EGNOS unusable – at least for city streets – where you have a shadowing effect through surrounding property that normally does not give you the nice conditions I had on the Teufelsberg. Seems I have to live with an accuracy of 15 meters for now – if there are enough satellites around to determine a position at all! 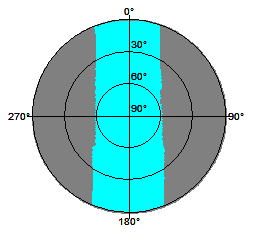 How about the number of GPS satellites you can receive with this shadowing during a whole day? 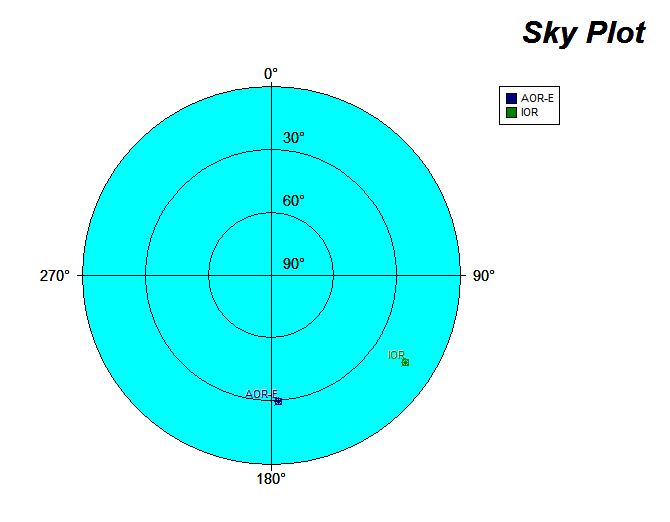 The visibility does not drop below 3 satellites needed for a 2D-fix, but for a 3D-position fix you will have problems around 3 and 4 p.m. and 2 and 3 p.m. (as a side note: conventional consumer GPS receivers have a suboptimal accuracy when it comes to 3D-fixes – jumping up and down tenth of meters is sometimes only a matter of seconds). So much for the visibility. How about the accuracy of the signal? Here the “Dilution of Precision” or DoP comes into play, which gives you a “soft” scale on which to rate the current accuracy. 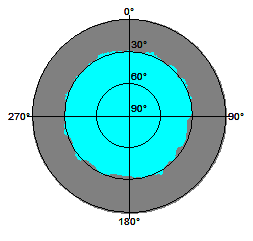 The basis for this position quality indicator is each satellite’s location relative to the other satellites in the current constellation and their position in relation to the GPS receiver. The moderate precision level in average does did not provide much confidence to me. But there is still hope! The local mass transit carrier (BVG) and the shipping carriers also had that problem – and they solved it using MW-DGPS, SAPOS and RDS to access more accurate DGPS data, right? So how about John Doe? Can we get into the exclusive DGPS circle without spending large amounts of money on industrial strength equipment? More on this in the next installment on GPS accuracy.